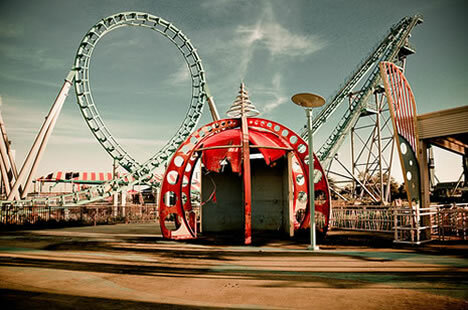 All of us are like excited children when turned loose for a fun-filled day at an amusement park. The commotion of the enthusiastic crowd combines with mouthwatering scents of delicious snacks waiting to be gobbled up, and then mingles with flashing lights and pounding music from rides and attractions. 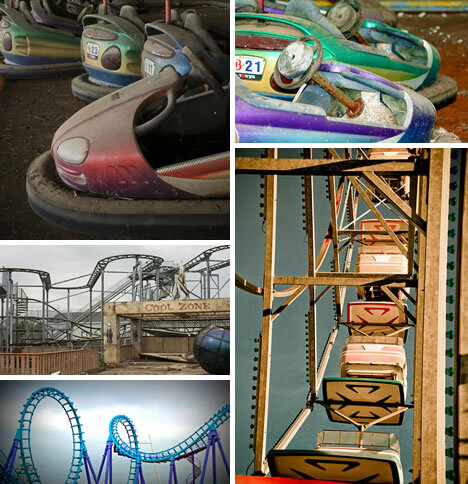 Yet when an amusement park becomes abandoned and an eerie silence descends to blanket the decay, the atmosphere seems to twist and takes on a nightmarish vibe. 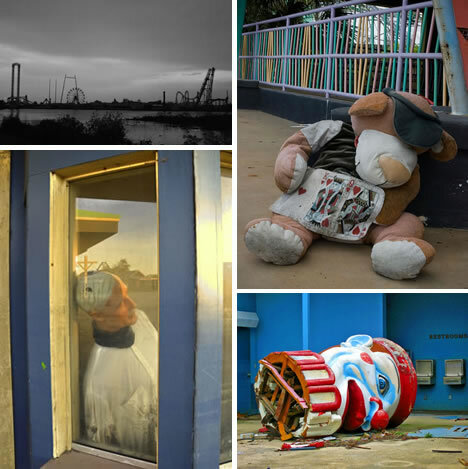 Hurricane Katrina devastated New Orleans, leaving Six Flags as another of its victims. 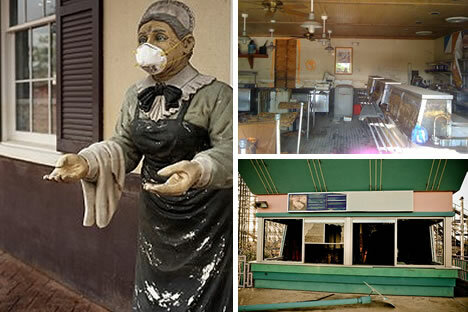 Here are 69 uber-creepy urban exploration photographs as we tour the abandoned amusement park Six Flags New Orleans. Everyone knows that Hurricane Katrina left New Orleans in utter devastation. That happened on August 29, 2005, and by August 31, New Orleans, Louisiana, was 80% flooded. Parts of it were under 15 feet of water, but the storm surged to over 20-feet high in some areas. 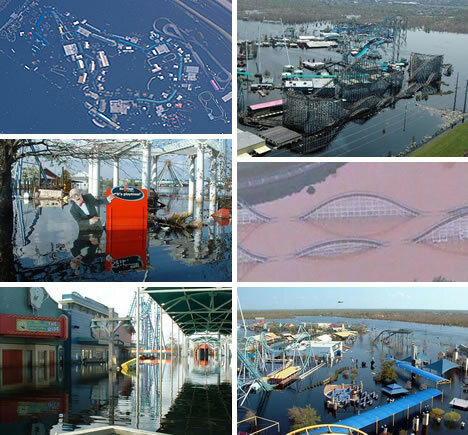 This drowning of the city included Six Flags. At the time, an amusement park was the least of people’s worries. However, 4 1/2 years have passed, and the good people of New Orleans have suffered more than their share. Does that mean they will also never regain this former place to play? In theory, the fate of Six Flags is undecided. You are here, Six Flags New Orleans, a defunct amusement park. It closed in 2005 for the oncoming storm and never reopened. 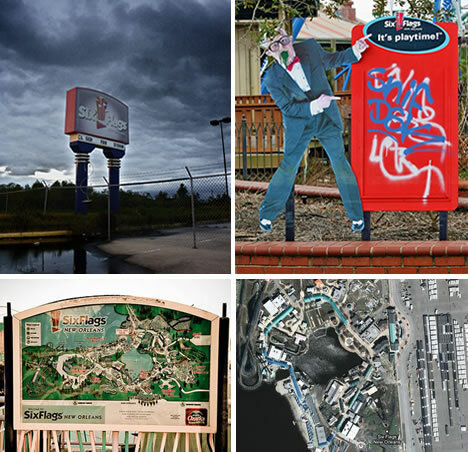 Four and a half years after Hurricane Katrina, Six Flags New Orleans is still abandoned. Six Flags officials claim the park was 70-80% damaged or destroyed. The defunct park is too expensive to rebuild and too expensive to abandon, so it sits and waits for decay to claim it. The park opened as Jazzland in 2000, but Six Flags bought this amusement park in 2002. 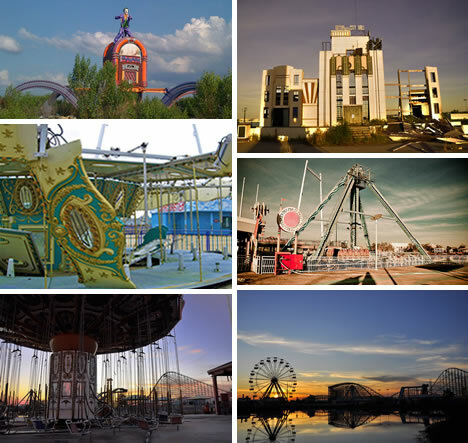 Before Jazzland, the area was swamps. 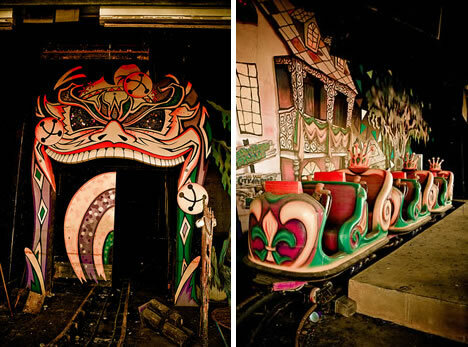 If no one steps up and does something, will the swamps reclaim the abandoned amusement park? 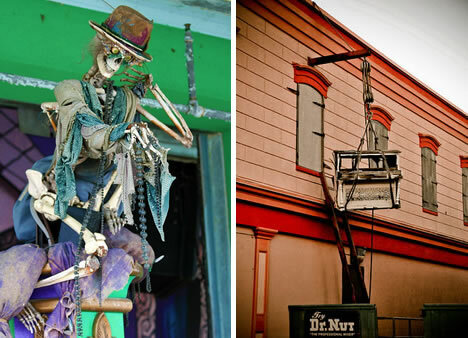 The worn and weathered Mardi Gras character hanging over the roof of the haunted car ride seems menacing now. But New Orleans is the home and heart of the Mardi Gras. 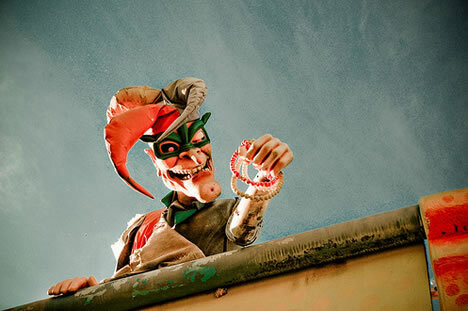 Before Six Flags was abandoned, it would have surely been a happy reminder to see this jester holding beads. Beads are a highly valued prize when one is lucky enough to catch those that are tossed into the parade crowd. Tickets please…? Oh that’s right, the mannequin in the booth is as lifeless as the abandoned amusement park. 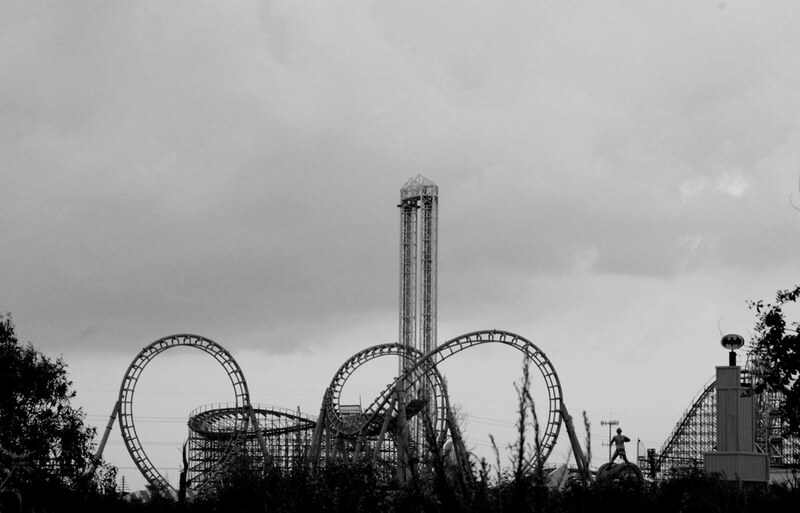 On the city’s eastern edge, serving as a constant reminder to the people of New Orleans, the stark silhouette of Six Flags is like an unhealed wound. The big stuffed dog has dealt his last hand. The creepy clown has been beheaded and broken. Hungry? There’s no scrumptious food to found in concession stands here. 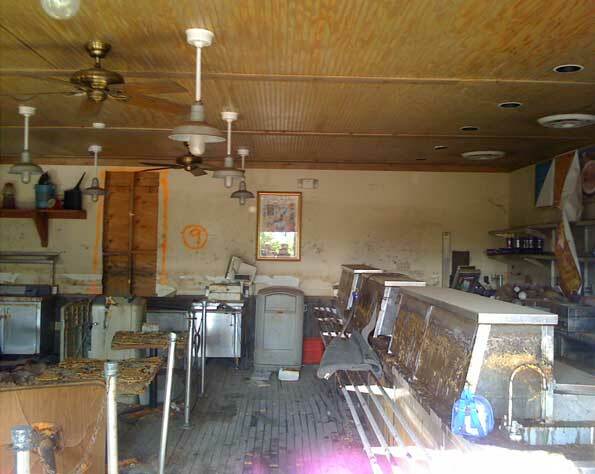 Instead, the walls, shelves, stoves, and glass food displays still show a scummy waterline where 4–7 feet of rainwater and sea water submerged the park for over a month when Katrina tried to swallow New Orleans whole. Six Flags tried to get out of the park, since it was going under even before the storm. Trying to get out of its contract and 75-year lease in 2006, they offered the city of New Orleans $10 million in cash and another 86 acres of land it owned in the area. The city refused on the basis of the amount being too small to repay a HUD loan or to clear the property. The amusement park suffered fatal damage. Six Flags collected only a portion before suing the insurance company for the remaining $175 million in coverage. At one point, Six Flags removed Batman: The Ride roller-coaster and other salvageable pieces. The city of New Orleans owned the land, yet Six Flags was pursuing legal action to keep the park closed. Six Flags filed for Chapter 11 bankruptcy in June. The city fined Six Flags $3 million dollars and ordered them to vacate the lease. Nickelodeon was supposed to redevelop the park into a water and thrill ride theme park, but that fell through late last year. In December 2009, California-based Big League Dreams expressed interest in possibly turning the amusement park into a 50-acre sports complex. For this to occur, New Orleans would need to cough up about $25 million for the cost of construction, and then Big League Dreams would staff and maintain the complex for 30 years. Mega Zeph, a wooden hybrid roller coaster, first opened as Jazzland’s signature ride. It has been decaying, the wood rotting and the steel rusting. Riders would climb a 110-foot lift hill before plunging into the first drop. The delightful magic of riders’ excited screams has not echoed through the abandoned park for over 4 years now. According to wikipedia, this park once operated these roller coasters: Zydeco Scream, The Jester, Mega Zeph, Muskrat Scrambler and The Road Runner Express which has since been moved to Six Flags Magic Mountain in California. 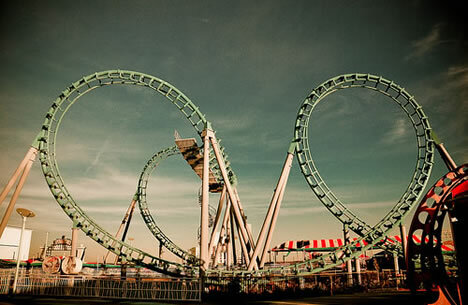 Most amusement parks feature a “boomerang” steel coaster, taking riders forward and flinging them backwards for the thrill of upside-down loops and drops. The Zydeco Scream at Six Flags sits silent, but had a history before coming to New Orleans. It began its life in 1990 at Parc de Montjuic in Barcelona, Spain, and was called Boomerang. In 2000, this roller coaster was moved to New Orleans and renamed Zydeco Scream. This is probably its final resting place, where it will most likely die for good and be remembered only as a ghost of good times. Flooding from Hurricane Katrina peeled away the green paint from The Jester as if revealing Jester’s former life as the Joker’s Revenge. 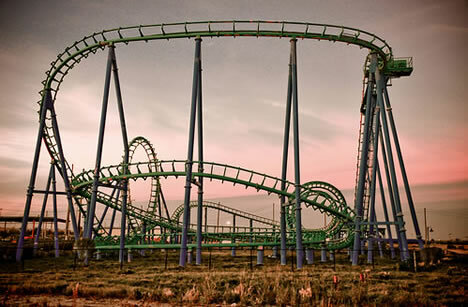 From 1996 through 2001, Joker’s Revenge operated at Six Flags Fiesta Texas. This roller coaster which took riders through a corkscrew backwards left many people complaining about the rough ride. Mechanical problems added to the dilemma, so the roller coaster was unused in 2002. 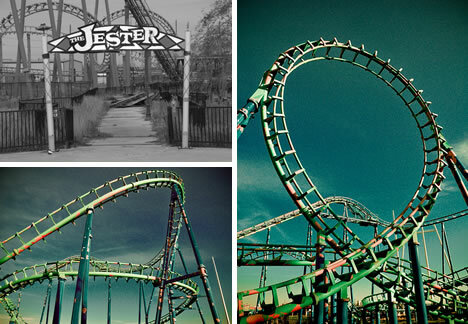 In 2003, the coaster was painted a bright green, renamed The Jester, and moved to Six Flags New Orleans where it’s now a ruined wreck. 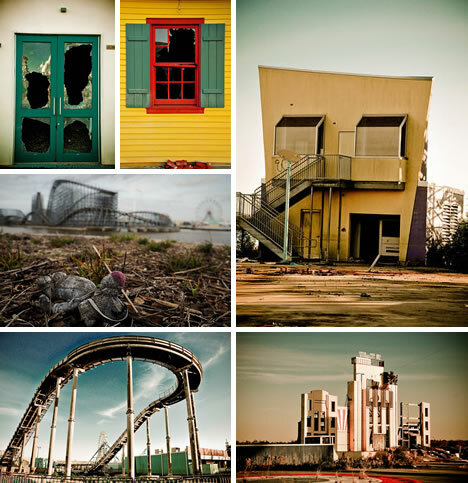 From gifts shops to Gotham City, crumbled and decayed Six Flags New Orleans suffers from catastrophic damage. Dark, desolate, and dejected, this post-apocalyptic setting might be the perfect place to make a movie about zombies or some such horror/disaster film. Revamped or refurbished, is there a chance for Six Flags to end up as more than another defunct amusement park? Way beyond the state of falling into disrepair, what was once cheerful is now cheerless and downright creepy. Although there has been some cleanup after Katrina ripped the amusement out of this park, it’s still left to be ravaged by the elements and unmaintained. 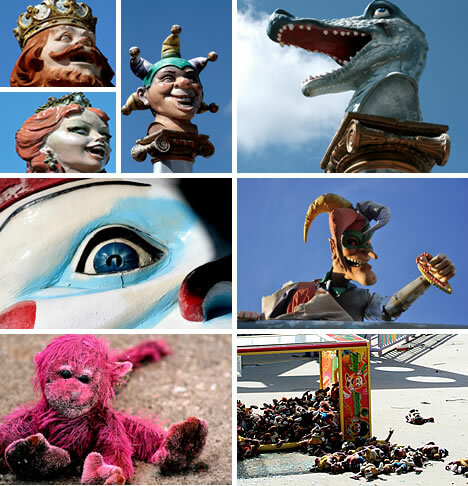 The creepy clown, menacing jester, and other statues with once happy open mouths now seem to utter a silent yet never-ending scream. These dismayed busts have “seen” their home destroyed. The stuffed animals which should bring children of all ages great joy, now seem hopeless and an ever-present and depressing reminder of 4 1/2 years passing after abandonment. The Krewe of Kreeps ride was never supposed to be this creepy. The trains sit parked as if awaiting phantom riders, but the tracks are a rusted wreck. According to wikipedia, flat rides at Six Flags New Orleans that are still standing but not operating include: Catwoman’s Whip, Dizzy Lizzy, Krazy Krewe, Gator Bait, Lex Luthor’s Invertatron, Mad Rex, Zydeco Zinger, Joker’s Jukebox, Lafitte’s Pirate Ship, The Big Easy, Jocco’s Mardi Gras Madness, and Mardi Gras Menagerie. Now it appears as if death is awaiting urban explorers at every turn. The Mardi Gras skeleton seems an ominous omen for those who venture out of curiosity into this abandoned amusement park. A piano hangs outside a building as the supports weather and rot as if waiting to claim another victim and add another ghost to roam New Orleans. The statues and busts appear beyond sad into miserable. With mud and mildew on his face, the man seems morose and forlorn. 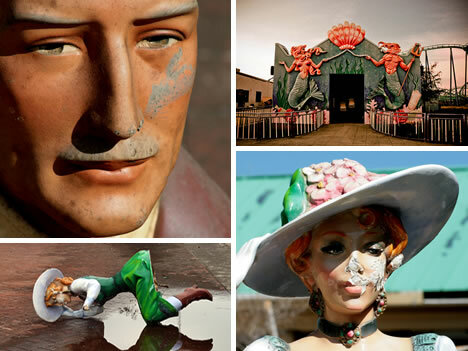 With chipped faces and bodies overturned, the southern belles are a gloomy reminder that Six Flags will probably never regain the glory and good times it once claimed. Even the lonely mermaid and merman seem melancholy. The bumper cars went from bumpless to rusted-out bummer. 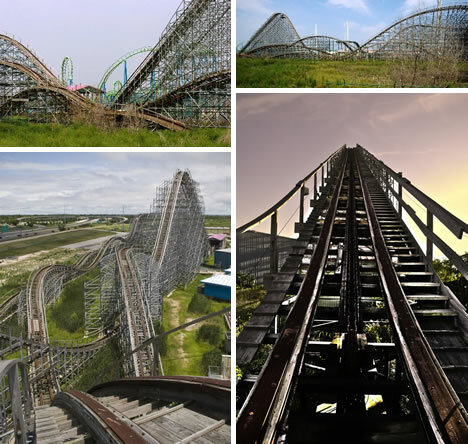 Here are more dead rides on our tour of Six Flags New Orleans, clearly showing that the abandoned amusement park is going to hell in a giant 140-acre hand-basket. 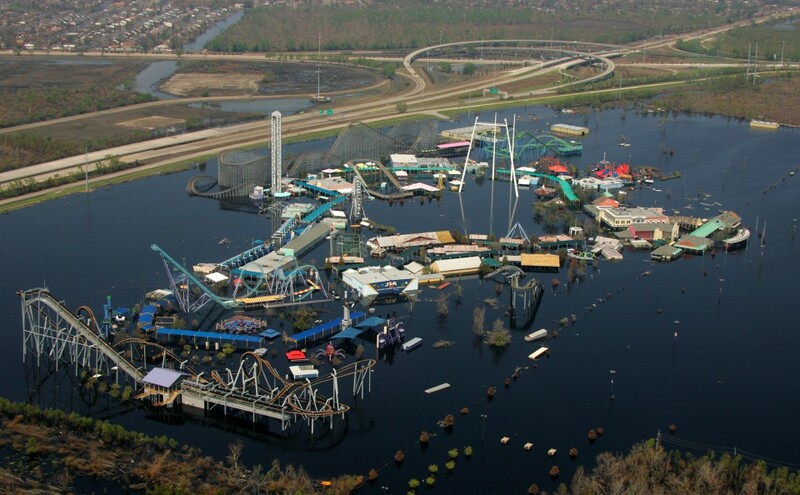 Even the former water rides Ozarka Splash and Spillway Splashout did not pass unscathed by Katrina’s wrath. The eerie silence at Six Flags is beyond unnatural for an amusement park. 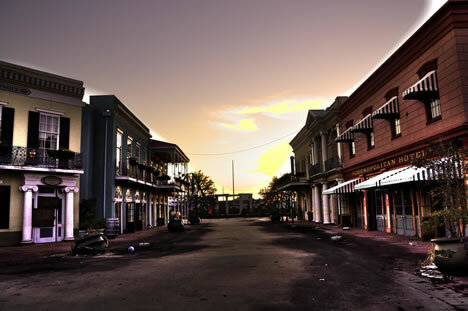 Left abandoned, Main Street is as deserted as a ghost town. 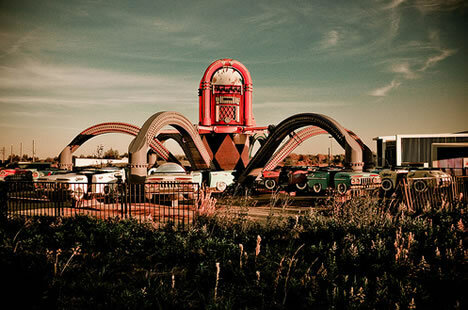 Destroyed by a horrific hurricane and flood waters years ago, the rides rust, the attractions rot, and the buildings crumble. Urban explorers first have to find a way into this forsaken park and then they risk their necks out of curiosity. In one case, after sneaking in and then back out, some of the explorers were handcuffed by the waiting cops and the film was destroyed. In other cases, the explorers are simply told to vacate the premises. Is it the park or city officials, or both, who don’t want the water-damage and despondent decay documented as photographed proof and becoming public knowledge? Or is it simply too dangerous, too painful, after all the hardships and tragedies the people of New Orleans have had to endure? 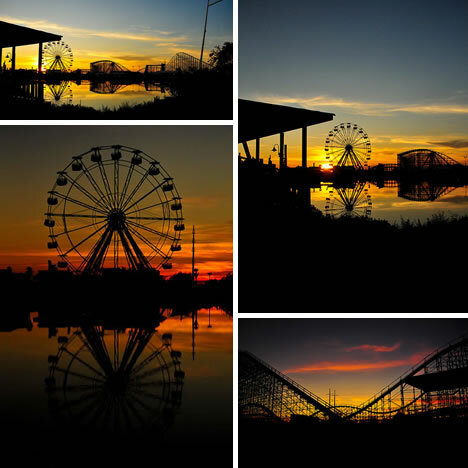 The Big Easy Ferris Wheel paints a pretty picture against the sunset. Darkness falls, but the curtains closed years ago on the final show at the abandoned amusement park. It’s sad yet intriguing, pulling at the curious who want to see inside the park, pulling at our hearts for the people of New Orleans who still need our help. 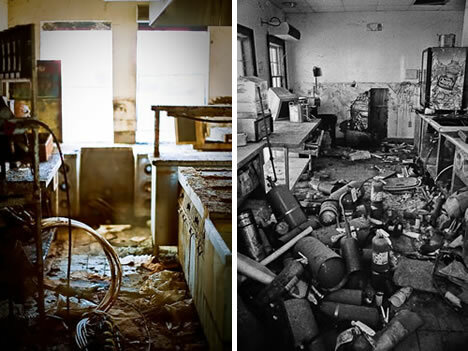 Thank you, urban explorers, for finding the courage to go inside. 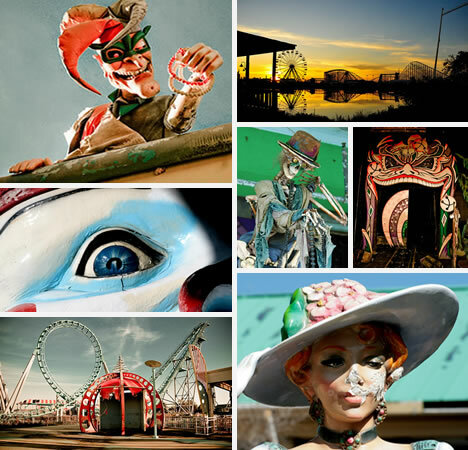 Thank you for bringing us these photographs so we could share your adventures at abandoned Six Flags New Orleans.